This post is about the best things to do in Sarajevo Bosnia. Sarajevo remains my favourite city in Europe and it is one of the most charming and interesting places I know. This travel guide to the best things to do in Sarajevo will discuss the history of the city, the best places to visit and a 2 day itinerary. There are so many things to do in Sarajevo that it can keep you busy for days. Personally I think you need at least 2 days to fully appreciate Sarajevo in all its aspects. Sarajevo gets more visitors every year, but tourism is still developing and this keeps prices low. The interesting museums ask just a small contribution, restaurants serve huge portions for little money, accommodation is cheap and most things can be explored on foot. In Sarajevo you pay almost nothing, but get a lot in return. It’s one of the most multicultural cities in Europe and the mountains are just a stone’s throw away. It’s turbulent history is another reason that makes Sarajevo an interesting visit that will teach you a lot of less known facts about European history. 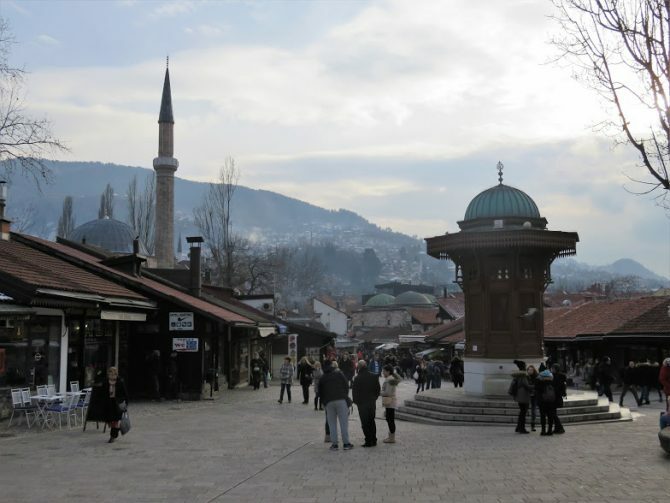 Sarajevo’s long and fascinating history of cultural and religious diversity is clearly visible. Someone told me Sarajevo is like an onion with layers that represent different timeperiods and I realized how true this is. The heart of the city is the old town where you travel back to the Ottoman times with its narrow alleys and mosques. Then surrounding the old town is the beautiful architecture from the Austro-Hungarian empire and on the outskirts of the city the sober flats of Tito’s communist rule. The highly multicultural city was not surprisingly called the Jerusalem of the Balkans. Unfortunately this didn’t always go well. Sarajevo is a city that entails many lessons from Europe’s past. Did you know for example that it was the murder of prince Ferdinand at the Latin Bridge that triggered the first world war. Did you know that during the second world war the Muslims in Sarajevo condemned the persecution of the Serbs by the Croatian Ustase. The muslims demanded security for all its citizens, regardless of their identity. The Sarajevo resistance was led by a soldier called Walter that was sadly killed on the day of Liberation in 1945. Sarajevo then became part of the socialist federal republic of Yugoslavia and in 1984 hosted the Winter olympics. Tourism increased and this was a good time for the city, despite its lack of democracy. With the declaration of independence from Yugoslavia one if its darkest times started. The capital suffered the longest siege in the history of modern warfare during Bosnia’s civil war. The Serbs encircled the city for 4 years and assaulted it with artillery from the surrounding hills. An average of 329 shell impacts occured every day. It is estimated that more than 12,000 people died because of the siege in Sarajevo. As a memory the ground was filled with red resin where people lost their lives. These so-called Sarajevo roses are still visible if you pay attention. Despite the traces that are left from the war it is now one of the safest cities in Europe and a symbol of hope and reconciliation. The city might have gone through difficult times, but the current developments have shown that its even harder to crush Sarajevo’s multicultural spirit. To get a better understanding about the civil war in Bosnia you can visit some interesting museums in Sarajevo. First of all there is the well organised exhibition called Galerija 11/07/1995 about the genocide in Srebrenica. This museum has left a deep impression on me and if you have time to visit only one museum go to Galerija. Nearby is the newer museum of crimes against humanity that focuses on the genocide in Bosnia in general. Its informative and worth a visit. The history museum is maybe not as well organised and impressive as the museums above, but they nonetheless have some interesting exhibitions that are not only about the Bosnian war, but also about the second World war and time under Tito’s communist regime. In fact, the museum used to be the revolutionary museum of Bosnia Herzegovina in the socialist federal republic of Yugoslavia. The nearby café Tito is a museum on its own and a great place to get a drink after your visit. To learn more about the siege of Sarajevo you can visit the tunnel museum at the outskirts of Sarajevo where the Bosnian army built a tunnel to smuggle food, weapons and humanitarian aid into the city. A small part of the tunnel is still there. The family that lived at the entrance of the tunnel have changed their house into a museum with information about the war in Sarajevo and the importance of the tunnel for survival. Logistics: to reach the tunnel museum a taxi would be easiest, but it is possible with public transport as well. You can take tram number 3 to Ilidza. Get off at the last stop and walk (30-40 minutes) or take bus 32 heading to Kotorac, also till the last stop. Another option is to take a tour. Infobosnia runs daily tours at 14:00 for 15 euro. If you are a student, bring your student card as the student price is considerably less. The afternoon is the perfect time to walk up the hills towards the Yellow fortress. These ruins from the old fortifications protecting the old town now offer wonderful views on the city. The first thing you will notice are the war cemeteries and beyond you will see the buildings and homes of modern Sarajevo. This is also the best place to escape the crowds. The small narrow streets give a village like atmosphere and its peaceful and quiet. The old town will bring you back to the Ottoman times. This is where East meets West and you can feel the influence that the Turks left behind many years ago. Old mosques, Quran schools, Oriental shops selling souvenirs and hip cafe’s and restaurants with herbal tea and Bosnian food. If nature calls, you can go to the oldest public toilet in Europe built-in 1530. A modernised version is still up and running. Close to the old town is the shopping street of Ferhadija. Ferhadija will bring you to contemporary Sarajevo where the government is working hard to erase all traces of the war. When you enter Ferhadija you will see the eternal flame. A memorial to the civilians and soldiers who died in Bosnia during the second World war. A bit further on you will find the sacred heart cathedral that is often considered as the symbol of the city. Behind the Bascarsija you can visit the Latin bridge. This Ottoman bridge over the Miljacka river is one of the oldest in Sarajevo. This fact is often overlooked, because the bridge is more famous as the site where Archduke Ferdinand was killed in 1914. The event that triggered the first World War in Europe. Markale Market is a small fresh produce market right next to the Bascarsija. It is of great signifance in Sarajevo, because of its sad history. A shell blast from the Serbian Army killed 68 people on 5 February 1994 and again 43 people on 28 August 1995. A small memorial at the back of the market depicts the names of the civilians that lost their lives in these events. Almost every building in Sarajevo has more stories to tell than first appears. Sarajevo’s City hall is one of the largest Austro Hungarian buildings in the city. In 1949 it became the National library with over 155,000 rare books and manuscripts. Some were from the 19th century about Bosnian cultural history. Unfortunately Serbian shelling in 1992 completely destroyed the library. After years of restoration the building reopened as a National monument in 2014. It is now used for a variety of events and exhibitions and it is definetly worth a look inside. If you want to know all the ins and outs of Sarajevo, I can recommend Neno’s free walking tour. Neno will show you all the secrets of Sarajevo and meanwhile shares his own experiences of his life during the siege. While walking through the city he will point out the Sarajevo Roses for you and share the stories behind some of the bullet holes on the buildings. In 1984 Sarajevo hosted the winter olympic Games. Years of communist rule and the war have left most Olympic buildings abandoned and deserted. Up in the mountains you can find the abandoned bobsleigh track that is now used for graffiti art. In the summer it is a nice hike up the mountain and the view over Sarajevo is beautiful. Logistics update: in April 2018 Sarajevo’s landmark cable car has reopened and will bring you from the old town to the top of mount Trebevic, only 5 minutes from the abandoned bobsleigh track. In the winter Bjelasnica offers a winter paradise for skiing and in the summer it is a hikers paradise with interesting trails to mountain villages such as Lukomir. How to get there: You can take a bus to Umoljani and then hike 3-4 hours to the village of Lukomir. Not far from Bjelasnica is Igman where there is a small memorial to the Yugoslav Partisans that fought against Germany during the Second world war. Behind the memorial lies an abandoned hotel that was used during the Olympics in 1984. I haven’t been there, but according to Atlas Obscura there are also some abandoned Olympic Jumps at Igman. Sarajevo makes a great place to make some interesting daytrips. For example you can go to Konjic and visit Tito’s bunker or visit the old city of Mostar. Although I would recommend 2 days for Mostar it is posssible as a daytrip. You can read more here about how to organise a visit to Konjic and Mostar and other interesting places in Bosnia in my post Backpacking Bosnia: Europe’s best kept secret. I can’t get enough of Sarajevo and there are so many things to do that I can keep coming back and always explore something new. However, most people have only one or two days. This 2 day Sarajevo itinerary includes the best things to do in Sarajevo. If you have only 2 days in Sarajevo I suggest you start your first day with a free walking tour to get a sense of the city. Most free walking tours end in the Bascarsija. The perfect place to have lunch. If you like to keep things cheap eat cevapcici at cevabdzinica Zeljo or have a filling traditional lunch at Inat Kuca. The rest of the day you can have a closer look at the bascarsija and either visit Galerija 11/07/1995 or the museum of crimes against humanity. Reflect on what you have seen with a cup of tea at Rahatlook or Cajdzinica Dzirlo and then walk towards the yellow fortress for a beautiful sunset over Sarajevo. The second day you can visit the tunnel museum. Then head back into town for a traditional lunch at one of the Ascinica’s such as ascinica hadzibajric in the Bascarsija. You can now wander around some places around the bascarsija such as Ferhadija street, the sacred heart cathedral and the latin bridge. With the new cable car it is also a short trip up to the abandoned bobsleigh track at Trebevic mountain where you have a beautiful view over Sarajevo. A perfect end of your visit to Sarajevo. Sarajevo has plenty of opportunities to find the delicacies of Bosnian cuisine. Cevapcici and Burek are everywhere in Sarajevo. For a good burek, just follow the smell coming from the bakeries. The most common are with spinach or cheese, but I also saw some with pumpkin. At last treat yourself on one of Bosnia’s sweet deserts. Forget about any diet you might have and treat yourself on baklava or tufahije (walnut stuffed apples stewed in sugar-water). Check out Airbnb if you look for a place to stay. Where else can you have a whole apartment for yourself for just 10 euro per person per night. If you haven’t registered yourself yet, click here to register and you get 30 euro’s once you finished your first trip with Airbnb of 65 euro’s or more. Sarajevo also offers some great hostels for those who like to meet up with other travellers. For a unique experience you can stay in the War hostel. This hostel was set up by a survivor of the siege and the hostel is all about experiencing what it was like staying in Sarajevo during that time. This is not for the faint of heart and don’t expect any luxuries. He also organises tours about the war such as the city war scars tour or a visit to a bunker or the frontline. Other hostels with good reviews are Hostel Kucha, Hostel Balkan Han and Hostel Franz Ferdinand. Sarajevo has an airport, but unfortunately flying directly to Sarajevo is not cheap. Wizz Air has flights from several destinations to Tuzla that is 3 hours from Sarajevo by bus. Sarajevo has 2 bus stations. The main bus station serves almost every destination in Bosnia itself, including Mostar (4 hours) and Tuzla (3 hours). International destinations include Zagreb (6 hours), Dubrovnik (8 hours), Split (8 hours), Podgorica (7 hours), Kosovo (8 hours), Ljubljana (9 hours), Vienna (12 hours) and even Belgium and the Netherlands. The Lukavica bus station in the Serbian part of town goes to many destinations in Serbia including Belgrade (5 hours). You can check the timetable here. Sarajevo seems interesting. I feel that places like these teach us the value of life and the devastation of war. Life is happy when it is simple. War unfortunately though avoidable never seems to be avoided. If only people understood the true value of peace. I would LOVE to try that restaurant without a menu! Sounds so… authentic! I’d super love to go! Sarajevo had been on my list for so long! And that tea shop! My goodness it’s like you’re speaking to my soul!! I agree with Jamie, the restaurant without a menu sounds really cool! Thank you for sharing this post. We definitely need to put Sarajevo on our list of Eastern European countries to visit. Will also check out Neno’s walking tour.